Ahmed drove one of the kitchen cars and Maged, who is normally based in the office in Cairo took hundreds of wonderful photographs and video. We then began our north-ward leg. First to Wadi Sura to see the Cave of the Swimmers, made famous in the English Patient film, then climbed up onto the Gilf Kebir plateau, a huge area high above the main desert. That night the camping was a little colder. We descended down a narrow wadi to the north, into red sand at Wadi Hamra. 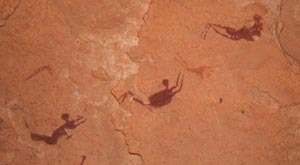 More rock art and sketching before setting off across the Great Sand Sea, the largest in the world with huge sand dunes running NNE to SSW for hundreds of kilometres. Travelling from east to west or vice-versa across the dunes is almost impossible and prevented Rommel from circumnavigating the 8th Army’s left flank in 1942-43 (together with the Quattara Depression further north). 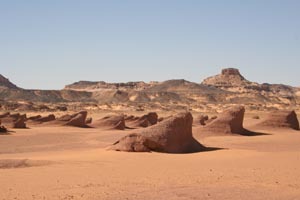 We however, were going north, so we’d drive so far and then have to ascend sand dunes, choosing as low ones as possible. Amazingly few wagons got stuck in soft sand, but when they did it was quite a sight to see the lads at work freeing them. Oddly enough, Saeed’s wooden splint held, even when we descended 300-foot 45-degree dunes with Jenny hanging on with white knuckles and wailing. At one camp in the Great Sand Sea we were joined one morning for breakfast by some Libyan hunters, a wilder-looking bunch I’ve rarely seen. A time surely to reach for the rifle, I thought. As it happens they turned out to be really nice chaps and showed us their beautiful falcon and their traps for catching falcons which attract price tags of up to $30,000 in the Gulf. EVentually we reached Bir Wahed, a palm-fringed pool not far from Siwa Oasis. Soon we were showering in a hotel, some 12 days since we last washed properly. Siwa is mind-blowing and Jenny and I lost no time in sketching the old town of Shali where the mud buildings were ruined during the 1920’s by a sustained heavy downpour. We felt extremely sad at leaving the guides, drivers and cooks who had done us so proud over nearly 3,000 kilometres, but there’s plenty more to explore out there so we’ll no doubt be back soon.